GMA 7 is proud to present another tv fantasy series adaptation of a Carlo J. Caparas creation, Kamandag. Starring Richard Gutierrez as the title role, Kamandag is a tale of a half-human, half-snake creature who is forced to live in the mortal world because of the conflict he brings in his birthplace. 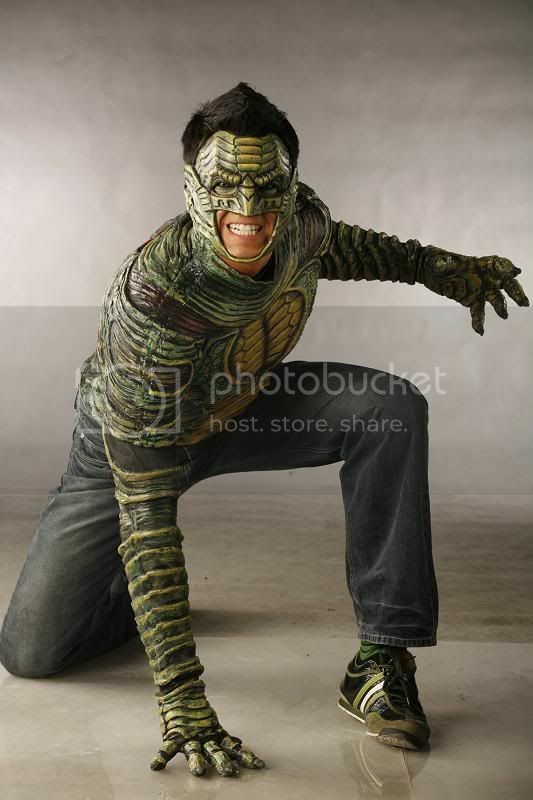 With his snake-like powers, he becomes a sort of hero in his town and the people begin calling him Kamandag. GMA 7 appointed Mark Reyes (Encantadia, Etheria, Atlantika) and Topel Lee (Quija, Shake Rattle and Roll 8 and 9, La Vendetta) to be the director of the said series. Because of the director's tandem, people are expecting that this series should be good. The production also commisioned the same team who did the production design and CGI designers for Encantadia and Etheria. As you can see the costumes are all well designed especially the Kamandag costume. Kamandag is set to premiere this Monday, November 19, 2007 in GMA Telebabad after Zaido : Pulis Pangkalawakan. For promitonal photos, go here. Hi there! CGI team for Kamandag were not the ones who did encantadia and Etheria =) This is the first time that Larger than Life worked with GMA, after their project, Rounin. Hindi talaga ako nanunuod ng Kamandag! Maganda sana ang kwento, kaso yung ka-Loveteam ni Richard na c Jewel Mische ba un? yuck no! hindi sila bagay! masyadong OA sya! Ay naku!!!! May isang Gina Star dyan, na nagbibigay ng mga extra talent sa inyo. Php4,000 lang d pa maibigay. Laging D makausap dahil may meeting daw k wilma galvante o d naman kaya nagdrdrive daw. Kkaunti lang ba tanggap nyan kaya di makabayad? BAKIT PO KAYA BINIBIGYAN PA NG KARAPATANG KUMUHA NG TALENT NG DOS AT NG 7 ITONG GNASTAR EH, MARAMING NALOLOKONG TAO BALITA KOPO KSI MALAKAS ITONG MAG PADULAS ABA BAKA DAHIL LANG SA 1GNASTAR MASIRA KYO. HOY MGA TAGA GNASTAR MAHAL ANG PAMASAHE NGAYON 400LANG PANGAKO NYO SA MGA XTRA TALENT DPA NYO MAIBIGAY O TALAGANG GAWAIN NYO NAYAN ANG KAKAPAL NYO PAGING KAPUSO AT KAPAMILYA IBOND NYO NA2. Gnastar ay naku, 2days ako dyan knuhang xtra talent awa ng dyos 2buwan na dpa ko binabayaran 400tf kaltas pa ng 50pesos para kay meng na bakla.